A good smile is something that many people appreciate. The only way an individual can achieve this objective is by having good dental health, which is only achieved by seeking services from well-qualified dentist. Dentistry is a dream career for many students. However, a question that many young students considering this to be their career choice is how long does it take to be a dentist? To become a dentist a person will take many years of schooling. 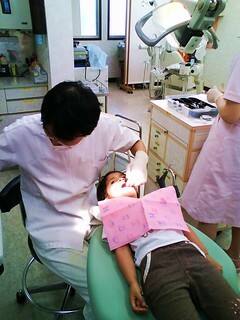 There is much, which a student is required to study in this field for him or her to be considered a qualified dentist. Included in this duration of study is hours of hands training that ensure that a student has see and experience what is expected in this career path once he or she got out in the real world seeking for employment. The field of dentistry is complex and this is not a career field for everyone. Nevertheless, for those students who can be able to dedicate and put their time in this profession, it can be rewarding. To start with there are two types of specialization which a student can pursue which are a doctor of surgical dentistry or doctor of medical dentistry. Both take care of the teeth and the mouth. In United States of America a student, need to choose first college where he or she will obtain four years degree before deciding what to specialize in. However, some schools may require a student to have study at least for two years but most of Ivy Universities requires a student to complete four years degree first. The bachelor degree should be in related field such as chemistry, biology and mathematics. Then you will need to write a Dental Admission Test (DAT) after bachelor’s degree to be admitted to dental schools. Your performance in this test will predict how you will do in the dental school; however, this is not the only consideration which evaluator thinks of. Your personality will also play a big role .It takes three to four years in the dental school but this duration will depend on the option, which you chose. Orthodontist: Here a student will specialize in installing and constructing braces and retaining any structural problems. Students are required to undergo one-year of internship and later three additional years of specialization. Periodontist: He or she deals with gums and other supportive structures of the teeth. Students who chose this as their career path are required to do two to three years of specialization after completing dental school. Endodontist: He or she specializes in root canals. Those who are dreaming this to be their career path will be required to specialize for two to three years after completing their studies in dental school. Oral maxillofacial surgeon: They perform reconstructive surgery. This career need a student to be patient a bit since the schooling is the longest of all .Students are required to cross over to other surgical fields. From high school graduation to graduation to this professional, it will take at least fourteen years to become a dentist in this field. Prosthodontist: He or she deals with replacing missing teeth and constructing dentures. A person who wants to choose this as his or her career path would be required to specialize for additional of at least two years after completing dental school to become a dentist in this area. Some schools may offer accelerated dental programs in which a student may earn a dental degree and complete dental school in seven years or even less. In these schools students are supposed to take heavy course load in dental topics such as physical and natural science in the first year of study. For them to move on to the dental educational component, they must meet Dental Admission Test (DAT) scores and program specified grades. In the last year, students are supposed to take advanced courses in dentistry for them to earn dental degrees. Admission into dental schools is highly competitive and it takes more than seven years for a person to be a dentist.